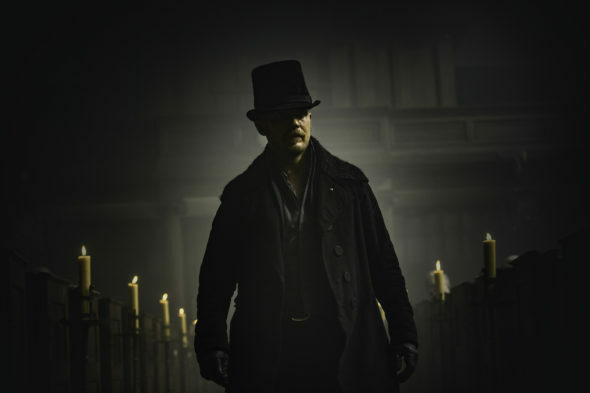 What’s next in store for Taboo? Recently, co-creator Steven Knight spoke to Deadline about the future of the FX TV series. Set in 1814, the historical drama stars Tom Hardy as James Keziah Delaney, an adventurer who returns to England after spending years in Africa. The cast also includes Oona Chaplin, David Hayman, Jonathan Pryce, Michael Kelly, Jessie Buckley, Jefferson Hall, and Scroobius Pip. The show premiered its first season on January 10th. What do you think? Did you watch the premiere of Taboo? Would you watch another season? I love this show. Taboo is a clear favorite. I have missed it. So glad it is confirmed for Seaon 2 and 3. Hoping nothing derails this plan. I would watch any number of seasons and wish a long life for Taboo. Please keep Taboo on. We love it. Good summer show and should be renewed for SURE !!! Love the show I keep watching the season 1. can’t wait for season 2 &etc..
My wife and I thoroughly enjoyed this show. Looking forward to future episodes. Loved the show. Hope there will be more seasons. Who doesn’t love Tom Hardy? Loved it. Best rhing on TV in years. Hardy is great. Jesus lord please renew this show. I never watch TV and I was hooked from the 1st episode. This show has taken a direction that separates it from anyother Television show. Absolutely amazing.